Enough said about this animal, one might say. I disagree. Great products are becoming scarce and when one sustains in competition for decades, there is some magic in it. My faithful workhorse since July 2011 do not fail. I bought it from the local hardware store without any preference on brand. It was on sale and I hate shopping. Enough for making the decision. Half an hour later we started our journey together. Ever since I have cooked outdoors around hundred times a year, rain or shine. The kettle has been standing on my yard on changing weathers throughout four seasons. All I have replaced so far have been the lid handle and the screw on top vent. Lid handle screws got rusty and the whole handle fell off but it was replaced under warranty in no time. The vent screw got rusty also but I just replaced it myself. In addition to the excellent warranty service, I like its versatility. With basic setup I can cook for two people or eight people. Choosing direct or indirect method gives me enough possibilities to vary my menu. I like to call it a workhorse for its endurance. Regardless of exposure to any weather, use or abuse it just works. After almost six years and six hundred rounds of cooking, it does not seem to age. 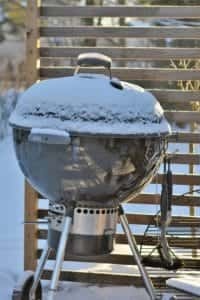 Do you have any tips for keeping the grill clean? I clean the grate always when it is still hot. This I learned hard way. Otherwise, I guess I am a bit lazy. Interior of the grill I clean with hot soapy water only twice a year.